Just thought I’d let you know two things. Biggest one is that made a little program in XNA for you guys to have fun with. It’s called Game Of Life, and it demonstrates the Behaviour System. 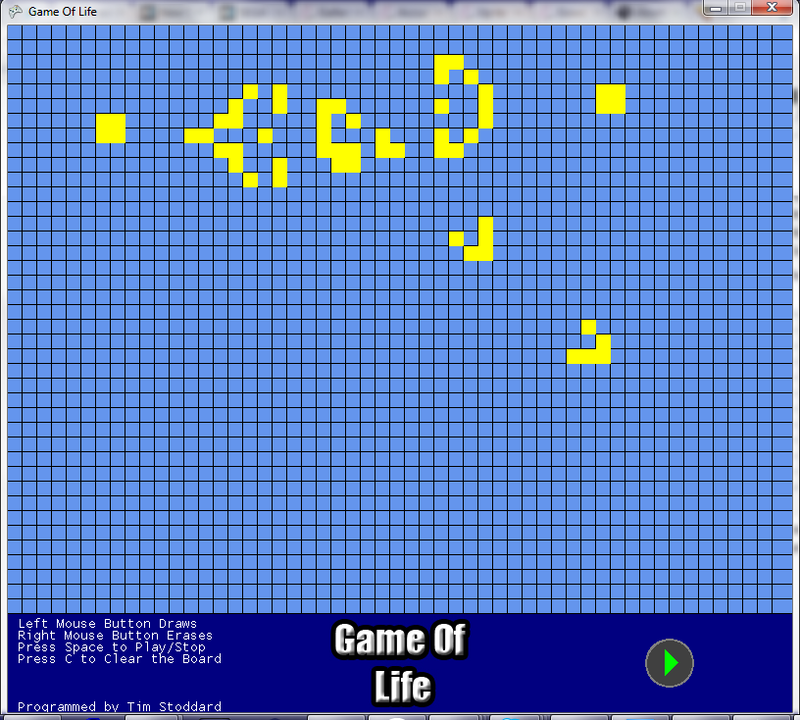 In it you can draw simple pixel shapes and then let it behave. If you know any special shapes of Conway’s Game of Life (some are on the Wikipedia Page), those (or at least most) will work. So download it from the page here and have fun! I’ve also updated the download links as Mediafire doesn’t seem to store the data permanently. – Fixed mouse pointer bugs that crashed the game on rare occasions. – Added the ability to change the speed of the GoL in action. Just re-download the game and hopefully installation should be fine. Siegfried will be a fantasy/steampunk themed scrolling shooter. At the moment I’m going to make this game (or at least a prototype) in XNA and maybe transfer it over to another engine or make my own to make more features in it and bring it to other systems (e.g. Mac and Linux). I’m currently trying to set some information down on what I want the game to be like and setting up the developing environment. I’ll also see about getting some temp artwork and tracks to test out everything. So Aardvark Swift did a talk today about getting into the Games Industry. It was some interesting, if not predictable stuff, such as getting C++, Maths and Problem Solving Skills, and working on a demo to show the companies that I wish to apply for. Hopefully this site will help me get working with that. As for right now I’m working through my modules on C++, OpenGL, Object Oriented Programming and System & Databases, and trying to go through my book on XNA and C++. Also trying to think up some ideas of games I could make as well.